En el reconocimiento de formas en cuanto hace referencia a la escritura manuscrita se abordan diferentes tendencias. Una de estas técnicas tiene que ver con el fenómeno de la generación de la escritura manuscrita desde el cerebro hasta el brazo. Se presenta en este artículo un análisis comparativo del desempeño de modelos en línea de generación de movimientos simples. Yasuhara, M , " Experimental studies of handwriting process ", Rep. Univ. 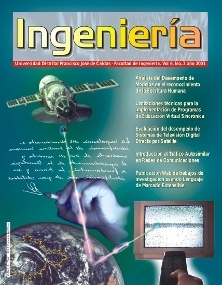 Electro-Comm., vol 25, pp. 233-254, 1975. Betancourt A., " Estudio comparativo y evaluativo de modelos en línea en el reconocimiento de la escritura manuscrita", Reporte Interno, U. Distrital, 2001. Betancourt A., Alimi A., Boumehdi Y., " Modélisation de l´écriture humaine ", Reporte Interno, École Polytechnique de Montréal, 1990. Plamondon R., Maarse F., " An evaluation of motors models of handwriting " ,IEEE Transactions on systems, Man, and Cibernetics, vol 19, No.5, 1989. Stren J.T, " Computer modelling of gross muscle dynamics", J.Biomech., vol7 ,411, 1974. Dooijes, E.H. " Analysis of handwriting movements", Acta Psicol., vol 454, pp. 99-114, 1983. Plamondon R., Stelmach G., Teasale N., " Motor Program Coding Representation from a Handwriting Generator Model " Biological Cybernetics; Vol,63 , pp. 443-451,1990. Nouboud F., Plamondon R., " On line Character Recognition System using a String Comparaison Processor ", Proceedings of 10th. IEEE International conferencie on Pattern Recognition., New Jersey, pp. 460-463,1990. Burr D. " A Normalising Transform for Cursive Script Recognition ", Proc. of 6th IEEE Int. Conference on Pattern Recognition, Munich, , vol 2, pp. 1027-1030,1988. Leclerc F.," Validation d´ un modé1e génération de vitesse á profil gaussien sur des signatures manuscrites ", memoire de maitrise, Ecole Polytechnique de Montréal, 1989. Press, W.H et al, " Numerical Recipes in C " Cambridge University Press, Cambridge, 1989. Plamondon R., " On the origin of asymetric bell-shaped velocity profiles in rapid-aimed movements ", Tutorials in Motor Neuroscience , Stelmach Academic Publisher , 1991. Plamondon R., " Handwriting Control a functionnal Model ", Cambridge University Press, pp.553-574, 1989. Morasso P. , Mussa F., " Trajectory formation and Handwriting " Biological Cybernetics, vol.45, pp.131-142. 1982. Van Der Gon D., Thuring J., " The guiding of Human Writing Movements " Kybernetik, vol.4 , pp.145, 1985. Eden M. " Handwriting and Pattern Recognition " IRE Trans. Inform. Theory vol,8, , pp.-160-166, 1962. Mermelstein , Eden M, " Experiments on Computer Recognition of Connected Handwriting words ", Inf. Centr., vol. 7, , pp.255270, 1964. Hollerbach, J. " An Oscillation Theory of Handwriting ", Biological Cybernetics, No. 39, , pp. 139-156, 1981. Plamondon, R, Lamarche F., " Modelisation of Handwriting " Graphomomics Contemporary Reseach in Handwriting, Netherlands, Elseiver Sci., pp,169-183, 1986. Attribution - Non-Commercial - Share the same: this license allows others to distribute, remix, retouch, and create from your work in a non-commercial way, as long as they give you credit and license their new creations under the same conditions.